Located in the Canadian Coast Mountain wilderness, Arc'teryx is built on the principle of obsessive, precise design and production. Our unique in-house manufacturing and design centres allow us to constantly evolve and build products the right way. Timeless quality, intuitive design and simplicity result in unrivaled performance at the point of extreme need. Looking up at SkyPilot and Co Pilot in the Sea-To-Sky Corridor, 45 minutes North of our head office. North Vancouver sits at the foot of the North Shore mountains, just minutes away from skiing, climbing, and harsh mountain environments. A unique setting for a city and the perfect crucible for innovative, purposeful outdoor designs. Founded by local climbers in 1989, Arc’teryx remains a gathering place of like-minded people. Our Design Centre is a hive, a hands-on think tank of active designers, materials experts, pattern makers and product developers who know what they want, how it will be used and why it has to work. 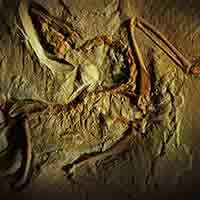 The brand is named after ARCHAEOPTERYX LITHOGRAPHICA, the first reptile to develop the feather for flight. At Arc’teryx our central purpose is to build the finest products possible. At Arc’teryx, the goal is to create equipment that enables a person to be immersed in the moment of doing, regardless of external conditions. Simple solutions to complex challenges; this is the essence of minimalism and our philosophy of design. Reducing the effects of weather, streamlining use, and moving efficiently creates a timeless, outdoor experience. Based as much on art as on science, good design is the result of instinct, discipline and discovery. We have an engineering team with the ability to create tools. At our factory, in addition to manufacturing products, we can test ideas and prototype constructions. Products that are as good as they can possibly be, performing over time and beyond expectation, this is the heart of what we do and the roots of this company —to create what does not yet exist. Our timeless designs are intuitive, minimalist and human-centric, emphasizing function and simplicity. At Arc'teryx, to challenge what exists and manufacture new ideas is the culture. Passion and curiosity fuel a continual drive to explore, to push the boundaries of what is known, regardless of assumptions. Most designs begin from need: a particular item that does not yet exist; refinements to an existing jacket or pack; addressing comfort or textile compromises; a feature that wastes time, increases exposure or is unnecessary. Design teams are given time to form relationships with their ideas and the opportunity to discover and appreciate the true nature of a product. Our field testing is unique: designers themselves test product in real world conditions as well as put them on athletes and industry professional for serious situational testing. As romantic as it would be to say that design inspiration is divine, function and the need for solutions are the primary initiatives for Arc'teryx products. Where do ideas come from? From places of curiosity, experience and profound knowledge. Dedicated to making the very best possible. Mike Blenkarn is an original, a creative thinker and a fixture in the R&D Department at Arc’teryx. A huge part of how he figures out what needs to be created and how to make it work best is through being outside and active. We are dedicated to the highest standards of craftsmanship with a unique, meticulous approach to precision manufacturing. Using only advanced premium materials, meticulous detail and unique construction processes enable us to create technical products that can be trusted to work in all conditions. A brand is only as good as the quality of its products. Our system of quality control gives us the confidence to guarantee that all products are measured by our standards. The "Made by Arc'teryx" label on all of our products signifies it as being of the highest quality available, deserving of our lifetime warranty. Our Quality Control process begins with the rolls of fabric as they arrive at the warehouse. Initially placed in quarantine, we randomly roll inspect 1/3 of all incoming fabric for colour consistency, flaws in manufacture and correct labeling before being released into stock. In the cutting room, fabric is visually inspected before the cutting process and any flawed sections are removed. During cutting, only a certain number of pieces are cut at once, for precision. Once cut, the various jacket parts are collected in bins and transferred to work stations. As bundles are made, pieces are checked for quality of cut and fabric. At this stage, all pieces are handled and 100% inspected. The pieces proceed through assembly stations for lamination, embroidery, seam sealing, zipper and drawcord attachment, where they are individually handled and inspected by operators who are responsible and accountable for the quality of their work. All finishing pieces: drawcord, grommets, snaps, cuff tabs and toggles are attached by hand, and each craftsperson visually inspects each component before assembly. In addition to this accountability, in-line checks are randomly done on 1/3 of all assembled components. The components - jacket hoods, sleeves etc. - are randomly tested for waterproofness. By this time, many individual parts have been inspected several times, by various operators and quality control personnel. After assembly, all seams, zippers and pockets are 100% inspected, and the garment, pack or harness must pass through a final quality control inspection for workmanship and cosmetic flaws of any nature. Our products provide the confidence to perform at the point of extreme need. We begin by challenging design assumptions. Solving problems from a clean page gives us the freedom to think beyond current materials and construction. Field testing in real world conditions fosters insight into building the highest performing products. For all the latest news from the Arc'teryx team, including interviews, trip reports, gear tips and product reviews visit the Arc'teryx Blog. Advance your mountain skills by attending one of our Arc'teryx Academy events. Visit arcteryxacademy.com. Arc'teryx's long term thinking on environmental stewardship, responsible manufacturing, and community engagement.